"CommPose: Visualizing Local Community Through Camera Phone Media" presented at DIME'06, Rangsit University, Bangkok, Thailand. October 2006. "hugms and .dot.dot.dot: personalizing mobile technology" accepted to UBICOMP'04, Nottingham, UK. September 2004. "The Slidepipe: A Timeline-Based Controller for Real-Time Sample Manipulation" presented at NIME'04, Hammamatsu, Japan. May 2004. 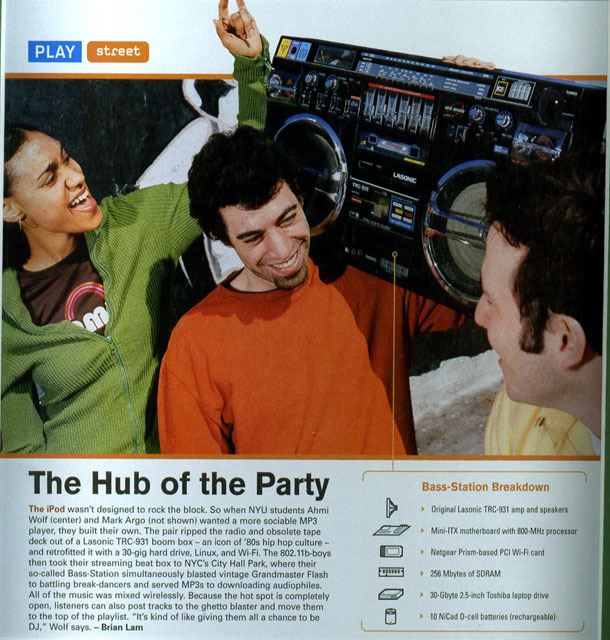 "The Bass-Station: A Community Based Information Space" presented at SIGGRAPH'03, San Diego. July 2003. "mobjects" Paper for Masters Thesis. Interactive Telecommunications Program (ITP), New York University. April, 2004. "Thinking About Remote Presence and Ubiquitous Computing Objects" Research Paper. Interactive Telecommunications Program (ITP), New York University. April, 2004.